Personally, I’ve always favoured waffles more. I’m all about the crisp exterior and soft inside with the little square ridges which are good for holding more maple syrup. Plus they just look cooler, ya know? I mean, pancakes are good, but waffles are my jam. 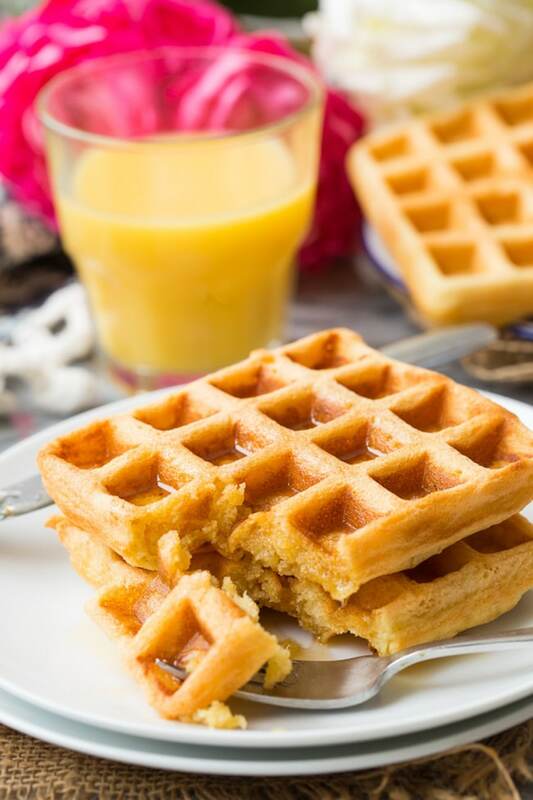 If you need more convincing just try these super simple chickpea flour waffles! They’re made with only eight ingredients and come together in no time at all. The recipe itself is pretty straight forward – it’s just a matter of whisking together the dry ingredients, then the wet, then adding it all together to make a thick, silky batter. Let the batter rest for about 10 minutes to give the flour time to soak up all the moisture. 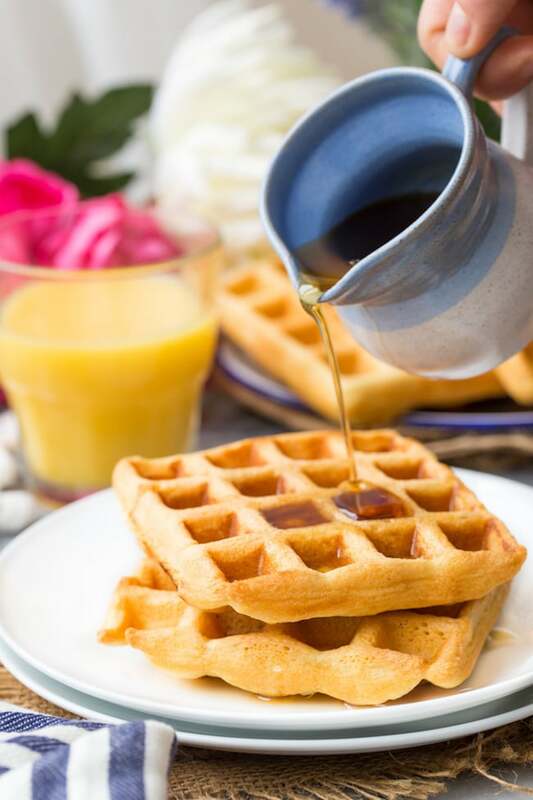 While the batter rests take this time to heat/grease your waffle maker and then it’s go time. Make it egg free: You can actually leave out the eggs altogether here. I found that these came out crispier without eggs but you do need to be a little more gentle with removing the cooked waffles from the iron and make sure you grease the iron well. Freeze it: Allow the waffles to cool completely then wrap up/seal in a freezer safe bag. You can just pop these in a toaster to heat through when you’re ready. Flour Substitute: Instead of chickpea flour you can also use regular gluten free all purpose flour or certified gluten free oat flour. The best part about these is saving leftovers/making extra to freeze and enjoy throughout the week. Having just got back home after a month away I’m currently thanking my past self for freezing a load of these waffles before leaving because right now I feel far too lazy to do any proper cooking today. Don’t forget to #asaucykitchen on instagram if you try these Gluten Free Waffles! We love seeing what you make! You can also post your pictures to my facebook page! Whisk together the dry ingredients in a large mixing bowl (chickpea flour, baking powder, cinnamon and salt) until no lumps remain. 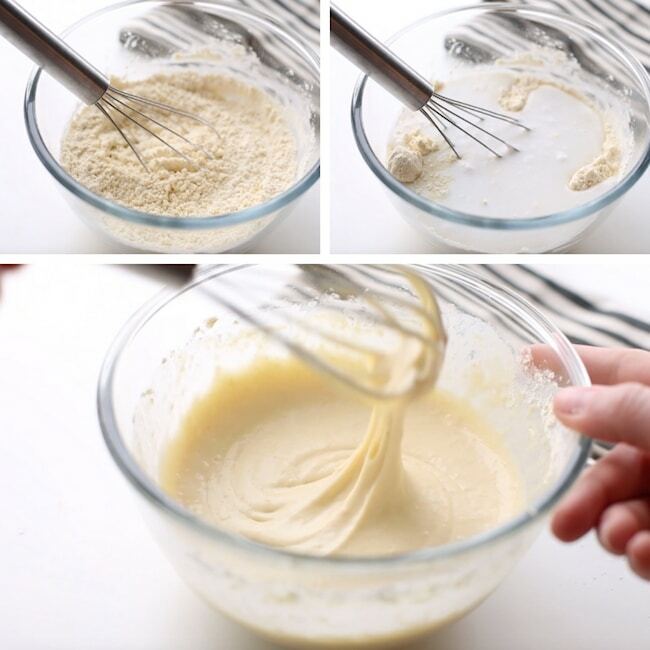 In another bowl whisk together the milk, oil, vanilla and eggs. Pour the wet ingredients into the dry and mix with a spoon until just combined. The batter will be a little lumpy and that's fine. Let the batter rest for about 10 minutes. 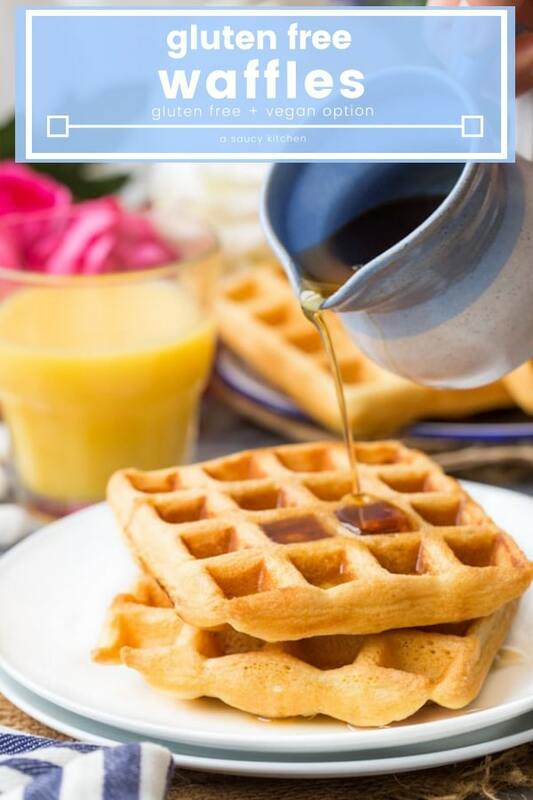 While the batter is resting take this time to prep your waffle iron according to its individual settings. If your iron allows you to choose the temperature set it to medium-high. Grease your iron plates if needed. When your ready, stir the batter once more and then scoop out 1/4 cup of batter and then pour onto the centre of your heated waffle iron. Close the lid and let cook until goldened and crispy. 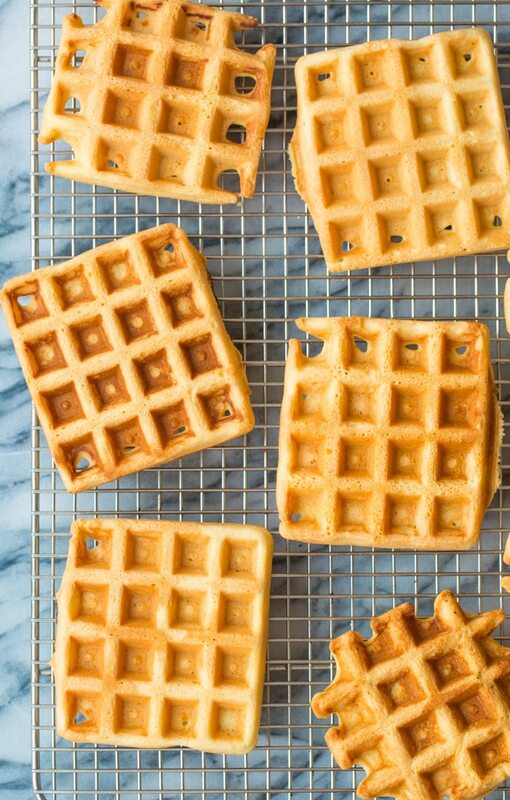 Transfer the cooked waffles to a wire cooling rack to cool and rest as you finish cooking the rest of your waffles. Make sure you don't stack them on top of each other or they will lose their crispiness. Repeat with remaining batter and serve warm with your preferred toppings. Freeze it: Allow the waffles to cool completely then wrap up/seal in a freezer safe bag. You can just pop these in a toaster to heat through when you're ready. Instead of chickpea flour you can also use regular gluten free all purpose flour or certified gluten free oat flour. can I use gram flour instead? Hi Addie! I could be wrong but it’s my understanding that chickpea flour and gram flour are the same thing so that’s no problem!